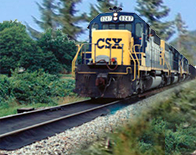 The railroad industry’s responsibility to the environment increases with every mile travelled. We are continuously searching for ways to help the industry meet environmental demands. In recent years, dramatic improvements have been made in reducing the environmental concerns associated with track lubrication. Biodegradable grease has played a big part in solving these problems. However, biodegradable grease is still not a complete solution in many track lubrication applications. To address the problems of soil and ballast contamination, we offer the CATCH-ALL™ Track Mat. Utilizing the latest Geocomposite technology, CATCH-ALL™ Track Mat provides a simple and cost-effective solution for maintaining a clean, safe site that also delivers maximum lubrication or friction management. CATCH-ALL™ track mats are effective for protecting soil and ballast at other rail operations such as equipment staging and maintenance, tie storage and bulk handling facilities. CATCH-ALL™ can also enhance reclamation of bulk solids at bulk handling facilities in addition to soil protection. CATCH-ALL™ Track Mats function as a "high-tech carpet" by covering the lubrication/friction management site ground surface. Placed over the ties, CATCH-ALL™ is easily and quickly cut to match any gauge face or top-of-rail applicator configuration for a custom-fit installation. Each CATCH-ALL™ kit consists of three modules - a gauge module 64 inches by 60 feet and two field modules 22 inches by 60 feet, all delivered in an easily managed, shrink-wrapped bundle. Installation is done by simply nailing CATCH-ALL™ to the ties with roofing nails. In applications consisting of concrete or steel ties, just nail CATCH-ALL™ to lumber placed in the crib. See the installation guide on our web site or call your representative for a copy. CATCH-ALL™ Track Mats require little or no maintenance. Excess lubricant that would have otherwise penetrated the soil or ballast is easily removed from the CATCH-ALL™ surface (when in place) or can be disposed of by removing and replacing the CATCH-ALL™ unit entirely. CATCH-ALL™ has excellent durability and is highly resistant to ultraviolet deterioration, solvents, puncture, excessive temperatures, moisture and high volume traffic. CATCH-ALL™ Track Mats consist of a semi-impervious, olefinic copolymer resin membrane that is bonded between two layers of non-woven polyester Geotextile. NOTE: CATCH-ALL™ Track Mat is a barrier type of solution to soil and ballast contamination. CATCH-ALL™ is not for applications where an absorbent is required for soil and ballast protection. CATCH-ALL™ will not absorb hydrocarbons. For applications requiring an absorption of Hydrocarbons please contact your representative for information regarding the GTPlus™ Absorbent TrackMat. CATCH-ALL™ Track Mat is part of the Portec Rail Total Friction Management™ (TFM™) program. CATCH-ALL™ track mat is the standard of the industry, but no track mat can be guaranteed to retain 100% of the grease, oil and other contaminants present in the railroad environment.